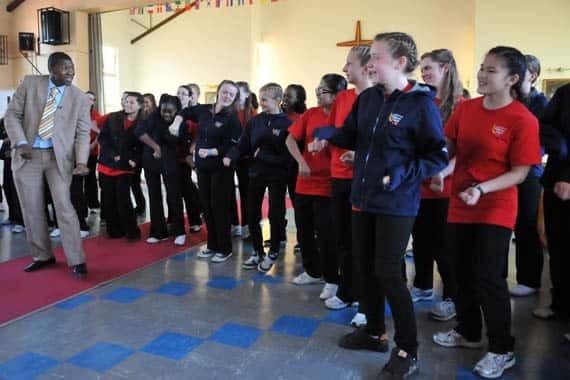 The Saskatoon Children's Choir embarked on a trip of a lifetime in July 2011. 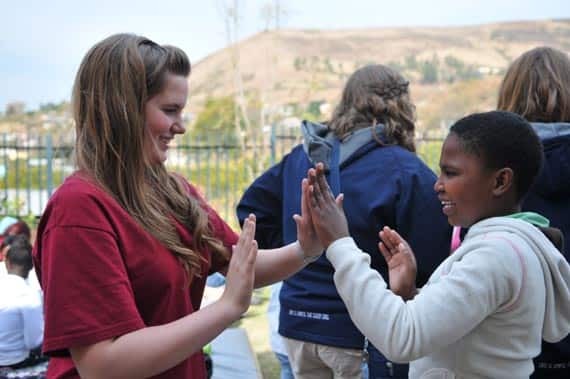 The 42 girls in the choir journeyed to South Africa for a concert and humanitarian tour. 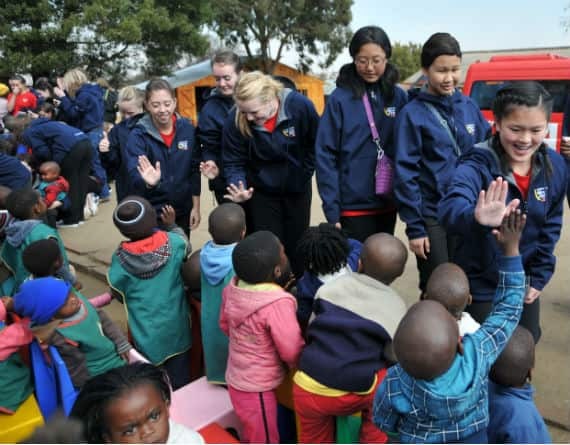 Along the way, they saw the reality of life in the Soweto township, met witnesses of the country's apartheid regime, and interacted with children who have been orphaned as a result of the country's HIV/AIDS pandemic. 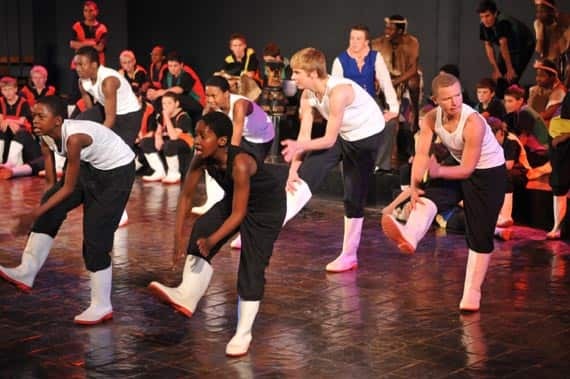 They also enjoyed an African safari, performed with many other choirs, and visited a penguin colony near Cape Town. I'm Shauna Powers from CBC Radio in Saskatchewan. 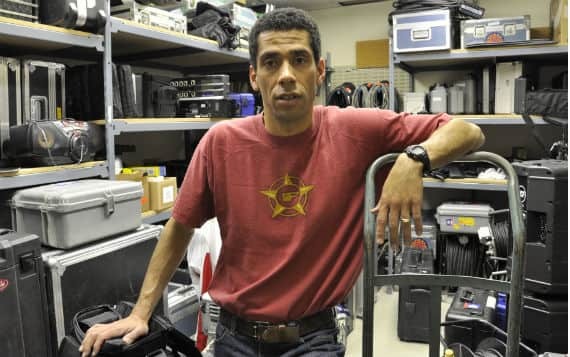 I was with the choir every step of the way, along with a small CBC/Radio-Canada production crew. We recorded their concerts, documented their life changing journey, and are delighted to be sharing their stories with you! On July 16th we visited Robben Island, a small island off the coast of Cape Town. 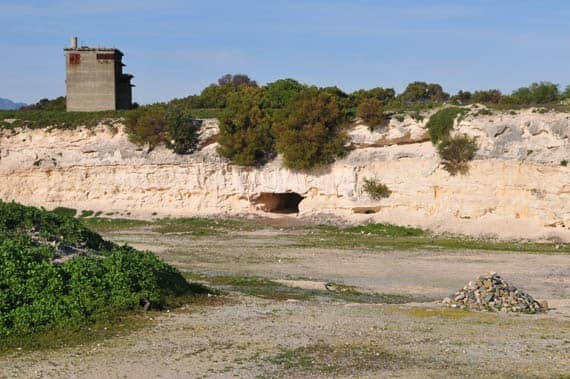 While the scenery in Cape Town is breathtaking, Robben Island - with it's rocky coastline and rugged landscape - has historically been a place of isolation and banishment. 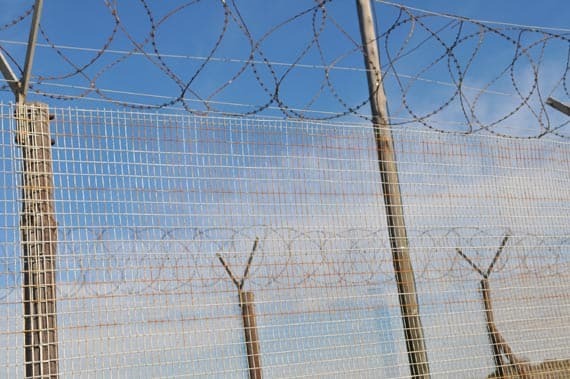 During the apartheid regime it was used as a political prison, and many of South Africa's most famous anti-apartheid activists were prisoners here for many years. Today it has been transformed into a living museum - a place for visitors to learn of it's history and celebrate apartheid's end. 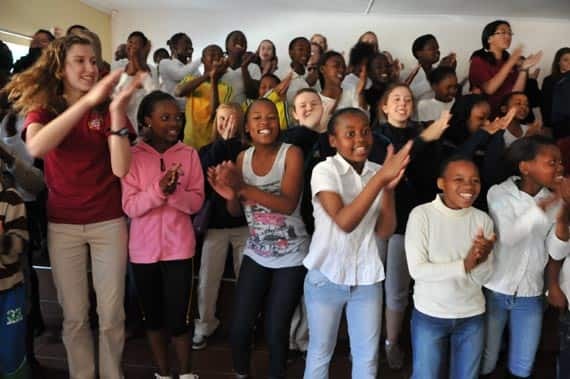 On July 14th, the girls of the Saskatoon Children's Choir visited Siyabonga Helping Hands. 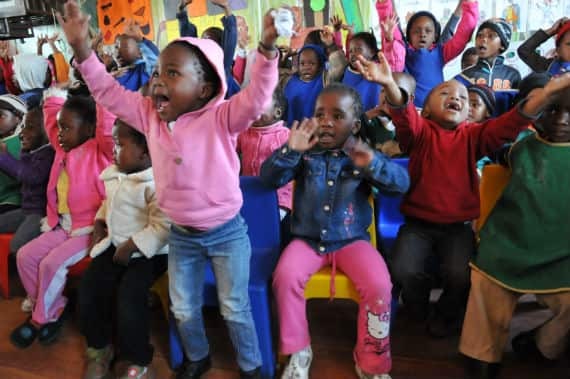 Located in the rural township of Esigodini, Siyabonga provides educational resources for children in the area. The people who run the centre believe education is a key to ending the cycles of poverty and unemployment many of the area's residents face. What the girls of the choir didn't bargain for, though, was how much fun they would have with these students! 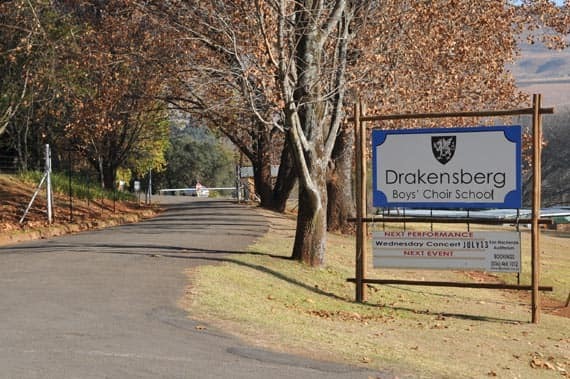 There wasn't a single day that was more anticipated than the visit to Drakensberg and the collaboration with the Drakensberg Boys Choir. We pulled into the region late afternoon on July 12th and checked ourselves into the most luxurious accomodation of the tour - the Champagne Castle Hotel. But it was the next day everyone was all revved up for. It even merited a full evening spent by the chaperones steaming the girls performance uniforms! Some experiences are so special they will resonate with you for the rest of your life. Let's face it - this South African trip has been full of those kinds of moments. Repeatedly we have been enchanted with the genuine warmth and kindness South Africans from all walks of life have shown to us. That happened again on July 10th in the small town of Mogwase. 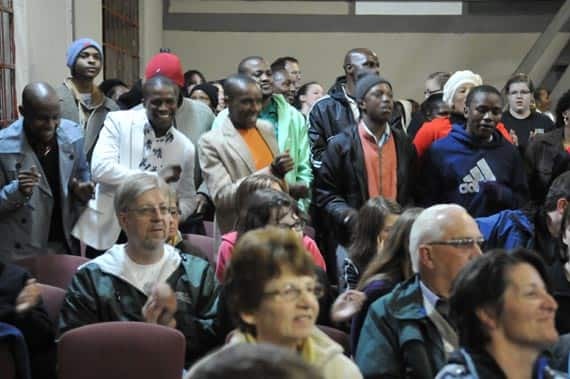 The Saskatoon Children's Choir were the special guests of a Christian congregation called Philadelphia Ministries. Before visiting the congregation we had a hunch we were in for a special treat. 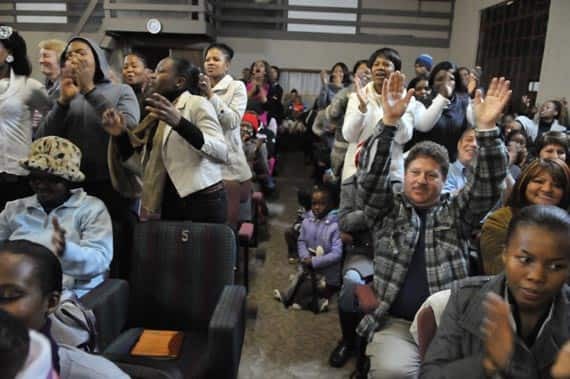 That was confirmed the moment we pulled up out front and heard spirited and soulful keyboards, bass and drums coming from the open window - and this was before church had even started! Need I say more? We had an unexpectedly up-close-and-personal encounter with an elephant when were on safari in the Pilanesburg National Park. 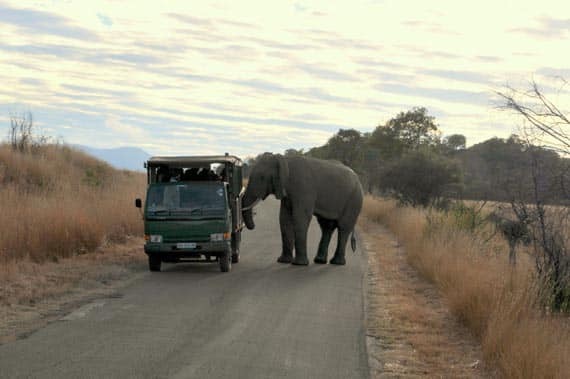 But Gabrielle's encounter was even closer than the rest of us who shared the safari vehicle. That young male elephant strode right up to her and looked her eye-to-eye before actually puncturing the side of our open aired vehicle with his tusk! It was inspiring and a little scary, but that is a few seconds of our lives none of us will ever forget. 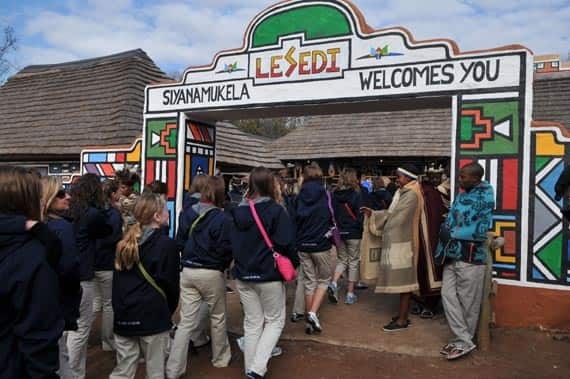 If Disneyland had a South African village this would be it! A concert tour is nothing without concerts, and today marked the choir's first official South African performance. It was a benefit concert for an organization called St. Peter's Care. They are one of many organizations trying tackle the immense problem of orphaned children in the country. In the afternoon, the girls spent some time learning about the organisation from Edgar Voigts. He began by asking them to close their eyes and imagine their lives without a mother, without a father, without an extended family, without siblings - a world without roots. Then he asked them what was missing in that picture. One of the choristers responded with the word "love". And of course she was right. 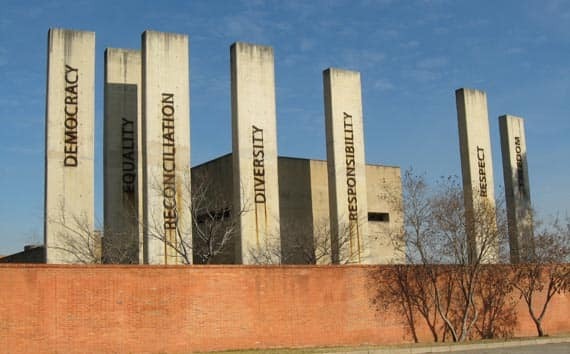 The Apartheid Museum is a Johannseburg landmark. The seven inscribed pillars outside the building immediately inform you this museum is not a theme park. Powerful history is being shared here, and it carries weight and substance. Phoebe Voigts, the choir's artistic director, knew she had to spend a little time preparing her choristers for the visit. She expected it would be a deeply emotional experience for them - both disturbing and inspiring - and she was absolutely right. Whenever the Saskatoon Children's Choir goes on an international adventure they have workshops with local conductors. It's part of the beauty of the experience. Phoebe Voigts gets to step back and observe the action, and the choir gets a whole new musical perspective. 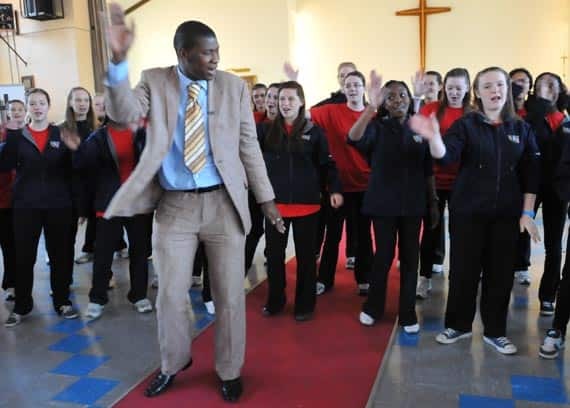 I don't think they had any idea what they were in for when they rolled into Holy Cross Anglican Church in Soweto, though. They certainly weren't expecting to spend the afternoon singing pretty complex African songs in several different languages! Today our South African adventure began in earnest with a visit to Soweto, one of the city's most famous areas. 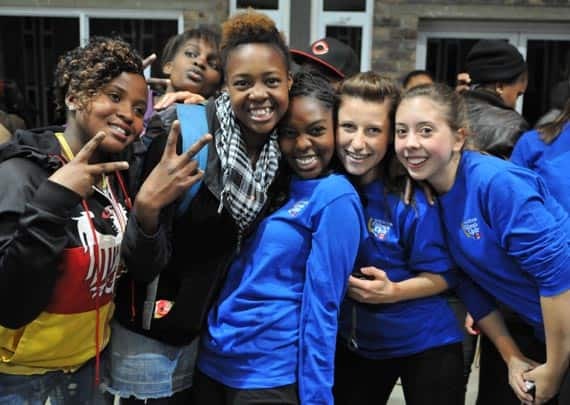 During the Apartheid regime, only black South Africans were allowed to live in the area, and it became a focal point of resistance to the oppression. Last month marked the 35th anniversary of the pivotal student uprising that gave voice to the country's young activists. We saw the corner where that all started along with very touching memorial in the location. We also visited 'Pam's Creche', a school for young children. Pam's focus is to create a positive and safe educational facility and she's used to having visitors from afar! 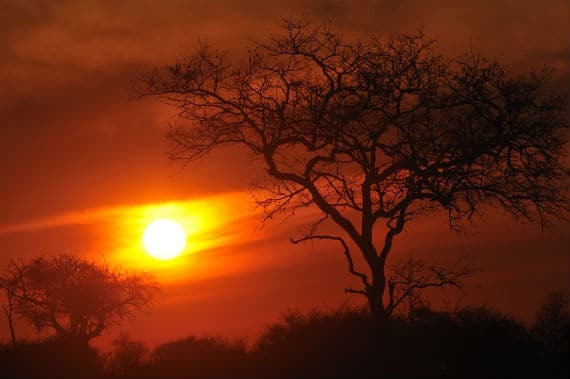 Any major international flight can be daunting - but when you consider the fact that the flight from Washington, DC, to Johannesburg, South Africa lasts a good 19 hours that raises things to another level entirely! The Saskatoon Children's Choir took it all in stride, though. They entertained themselves in the airport lobby by playing with small children, spending loads of time braiding each others' hair, and browsing around the airport shops for a little entertainment. What started out as individual adventures on the way to Washington, D.C. became our first collective gathering in our hotel near the Washington Dulles airport. 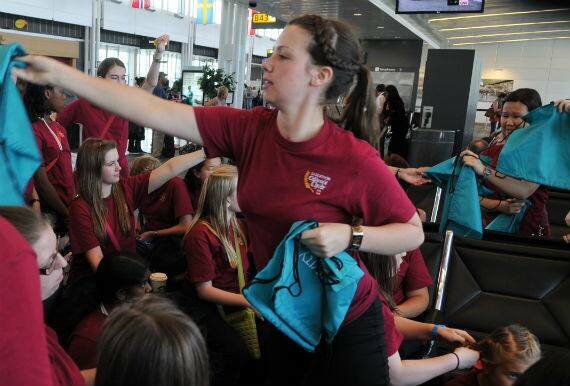 The Saskatoon Children's Choir had started their day at the Saskatoon airport at 4:00 am Tuesday morning and didn't roll into Washington until 14 hours later. 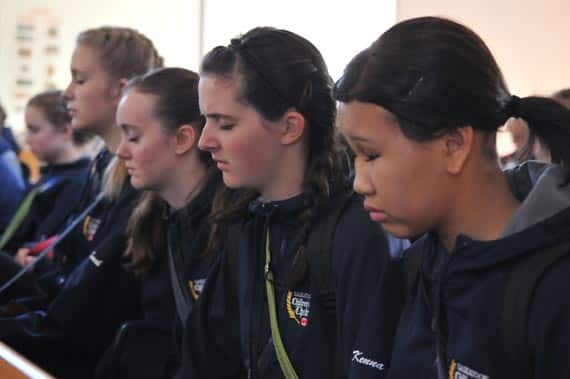 All the girls had plenty of down time on the plane, and at least one of them used that time to jot down a few thoughts about embarking on this experience. Julie wrote, "Travelling, stepping outside your comfort zone and crossing the boundaries of your day to day life makes you realize that your world is not the world. I look forward to expanding my world in South Africa, a place that has only existed to me as a map, book or conversation. Now it will become reality". The Saskatoon Children's Choir has always had a strong committment to humanitarian initiatives. For this trip, they've raised money to put together school kits for African children, and they'll be taking many of these kits with them on their trip. Before their rehearsal on June 12, they took some time to put them together. In less than 30 minutes the girls assembled 350 kits! Each chorister will take one kit in her suitcase and the rest will be mailed to Africa by Canadian Lutheran World Relief. OK - there are recording gigs, and then there are recording gigs! This has to be the mother of all remotes for me and Chris. After all, normally when we go out and record a concert in the province, we either have our recording mobile with us - which is basically a recording studio on wheels - or we have a van packed to the rafters with consoles, pre-amps, mics and mic stands, and many other "essential" pieces of gear to ensure a successful recording. 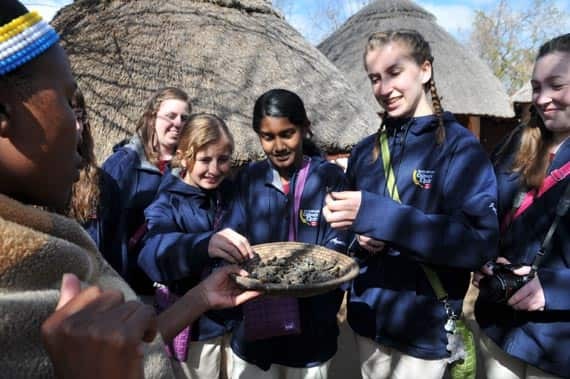 I first heard about the Saskatoon Children's Choir's journey to South Africa a little over a year ago. On a whim, Phoebe Voigts - the choir's artistic director - sent me the details in an e-mail. I was just about to travel to Hawaii for a holiday, and she offered it up as "some inspiring reading for the plane....". Phoebe was encouraging me and recording engineer Chris Haynes to join the choir on their big adventure. At the time, I didn't even give the idea serious thought - it seemed an impossible dream. I certainly never believed I would actually be boarding the plane with them when they started their journey across the world!